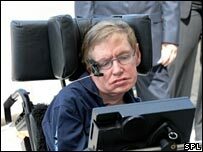 Scientists are hopeful that they have found a way to halt the progression of motor neurone disease (MND). A team at Bath University discovered a causal link between the gene involved in the formation of blood vessels and the development of some forms of MND. Mutant versions of the gene's product - angiogenin - are toxic to motor neurones, so blocking this process may stop the disease, they say. The latest UK work is published in the journal Human Molecular Genetics. There are about 5,000 people suffering with MND at any one time in the UK. The condition affects men more than women and one or two people in every 100,000 will be newly diagnosed with MND each year. In MND, over time, the cells responsible for transmitting the chemical messages that enable muscle movements become injured and subsequently die. Ultimately, the disease fatally interferes with those muscles involved in breathing. Last year, scientists discovered that some patients with MND have a mutated version of the human angiogenin gene. Since then, experts have been trying to find out what role angiogenin plays in the maintenance and development of motor neurones. Lead researcher Dr Vasanta Subramanian said: "We have found that mutated versions of this molecule are toxic to motor neurones and affect their ability to put out extensions called the axons. "If we can block the function of the faulty angiogenin in patients in which it is present, this may help to maintain healthy neurones and prevent further progression of the disease." So far the work has been carried out in mice. But the researchers are hopeful that angiogenin holds the key to developing ways of preventing disease progression in humans. Dr Belinda Cupid, of the Motor Neurone Disease Association, said: "MND research is greatly hampered by the fact that the cause of over 95% of cases remains unknown." She said there was mounting evidence that proteins like angiogenin could be implicated in some cases. "These important results add further evidence to this exciting area of research. We hope that one day soon this knowledge can be translated into innovative approaches to therapy."